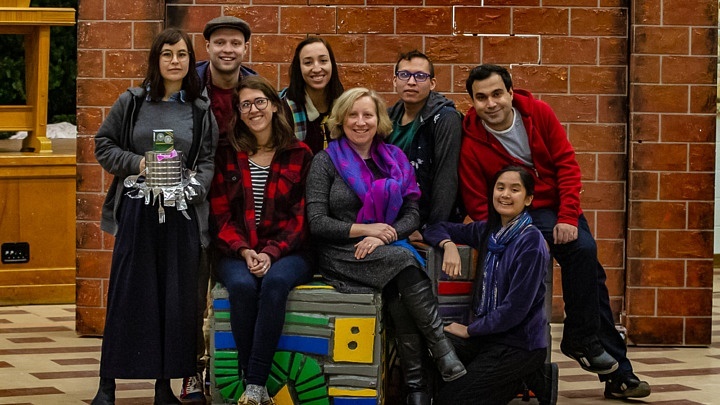 Carousel Players is known for bringing thought-provoking theatre to a younger crowd as they tour their inventive creations to school gyms across Southern Ontario. 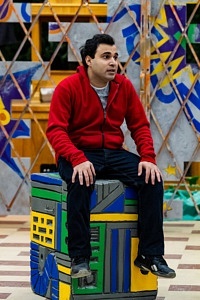 Their latest play Whole World explores themes of communication and understanding through the story of Omar, a young refugee who has newly arrived in Canada. Members of the DARTcritics class of 2019 give their take on the nature of watching theatre intended for a young audience in two very different environments. 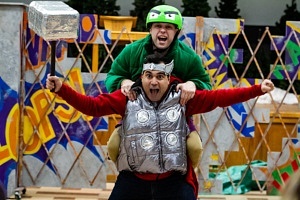 Brady Van Vaerenbergh as Alex, Ahmad Meree as Omar. Design: Christine Urquhart. Photo: Erica Sherwood. Supplemented by Christine Urquhart’s startlingly accurate costume design, the actors successfully embody children. The audience is invited to observe Kashira (Nicola Franco), The Kid (Joseph Recinos), and Alex (Brady van Vaerenbergh) as they navigate their developing relationship with a newcomer to their school: Omar (Ahmad Meree), a Syrian refugee. The actors leave behind their habits of adulthood and convincingly draw the audience into their grade-school dilemmas. Specifically, Franco plays a clever pre-teen character, who is very passionate about using documentary film to create social change. Thanks to Franco’s consistent sincerity, I became as invested in the documentary film as her character was. I, a 21-year-old university student, found myself nearly leaping out of my seat to hush the children in the audience when Franco began filming because I did not want background noise in her footage. The set pieces, also designed by Urquhart, surround the actors in an intricately constructed world. Although compactly designed, the colourful set depicts several locations, including a schoolyard, backyard, junkyard, and more. The detailed set pieces are captivating, especially in the scenes where the children play in the scrap pile. Kitchen utensils, recyclables, plastic buckets, and a bicycle are all incorporated into the junkyard set, which, by its playful atmosphere and flashy colours, is seemingly the physical expression of a child’s imagination. The cast also performs some basic STOMP-esque musical percussion in the junkyard, directed by Maddie Bautista, satisfying my desire to explore the limits of the debris myself. Through the lens of childhood, a universal experience, Whole World opens up a conversation about cultural difference. Carousel Players draws on the dramas of childhood in order to deal with issues that humankind cannot outgrow, such as the complexities associated with intercultural acceptance. Whole World asks the young—and young-at-heart—to confront the impacts of intolerance, and encourages them to reimagine the junk of prejudice. A play meant for children, and not one child is in the audience. This realization hits me as I walk into The Robbie in the Niagara Folk Arts Multicultural Centre to view Carousel Players’ production of Whole World by Sean Dixon. It soon becomes clear to me that this story is not just meant for children. As director Monica Dufault notes in the program, this is a story “about how misunderstandings and preconceptions can give way to tolerance and true friendship,” and that is a message that can appeal to both adults and children alike. 12-year-old Syrian refugee Omar (Ahmad Meree) is trying to fit in at school but finds it difficult when he has a run-in with the not-so-tough self-describing “tough guy Alex” (Brady Van Vaerenbergh); neither one of them truly understands the other, and hapless misunderstandings ensue. Fellow 7th grader Nashira (Nicola Franco) documents and enables these events, while The Kid (Joseph Recinos) spurs them on further. Ahmad Meree as Omar. Design: Christine Urquhart. Photo: Erica Sherwood. Whole World’s message of inclusivity is loud and clear, not only through the actors’ performances, but also in how they use their space. At times they surround, and even engage with, their small audience. Although the adult cast performs as children, they take the theme of bullying to a more complex level than child-like playacting. In the talkback after the show, we discover that Meree had only two weeks to learn the part of Omar. Included in the brief discussion, Syrian-born Meree discloses that he too felt confusion and hurt similar to Omar due to ignorance and misunderstandings when he moved to Canada as a refugee in 2016. As an adult, he went through similar struggles as his 12-year-old character, and it is visible in his performance. Christine Urquhart’s set seems quite simple at first. Much like Omar and Alex, the two plain brick walls stand separate and alone. But, like puzzle pieces, the cast breaks them apart, and before our eyes, the plain brick walls transform into a colorful and musical junkyard, full of depth and diversity. The set mimics the characters: once closed off and alone, then opened up and full of life, color, and music. It is difficult to not only tackle dark and heavy themes of bullying and intolerance, but to also transform them into a performance full of light and hope. The talented artists with Carousel Players do just that, as the once divided characters become united in the end. This small cast and the artistic team behind them allow for these lessons to stretch far beyond the playground in the hopes of reaching the Whole World.